24 cm xxiii, 380p. : ill. 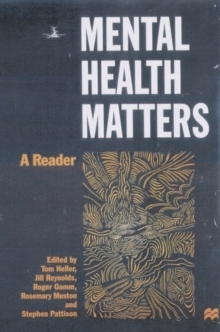 Mental Health Matters is an innovative, interdisciplinary collection of texts which challenge traditional understandings of mental health, emphasising the perspectives of mental health service-users. Combining classic writings about mental health practices and problems from psychiatry, sociology and psychology with specially commissioned new articles, it considers theories and debates in mental health and distress; the social and historical dimensions of mental health; involving users in mental health services and practically improving those services. These readable and diverse writings will be an important resource for all those with an interest in understanding mental health and making care services more responsive, whether they be service-users, carers, students or professionals.